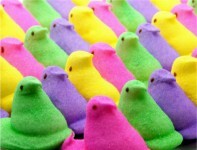 How many Peeps are sold at Easter time each year? Treat your students to some authentic and delicious Easter math. Students estimate the number of Peeps sold each Easter season. They consider reasonability by making guesses they think might be a little too high and a little too low. Students determine necessary info, problem solve and improve their original estimates. They conduct random samplings of their estimates and compare the mean of their estimates to the actual number of peeps sold each season. A Peeps video,the math activity, hints and data are below. For members we have an editable Word docx and extra data and solutions. Also appropriate for this time of year is our Holiday candy sales activity.